"Utah State" redirects here. For the U.S. state, see Utah. 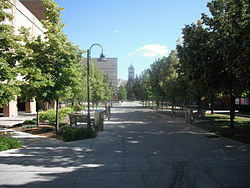 Utah State University (also referred to as USU or Utah State) is a public land-grant research university in Logan, Utah. It is accredited by the Northwest Commission on Colleges and Universities. With nearly 20,000 students living on or near campus, USU is Utah's largest public residential campus. As of Fall 2018, there were 27,932 students enrolled including 24,880 undergraduate students and 3,052 graduate students. The university has the highest percentage of out-of-state students of any public university in Utah totaling 23% of the student body. Founded in 1888 as Utah's agricultural college, USU focused on science, engineering, agriculture, domestic arts, military science, and mechanic arts. The university offers programs in liberal arts, engineering, business, economics, natural resource sciences, as well as nationally ranked elementary & secondary education programs. It offers master's and doctoral programs in humanities, social sciences, and STEM areas (Science, technology, engineering, and mathematics). It received its current name in 1957. The university is classified among "R2: Doctoral Universities – High research activity". Utah State University has produced 7 Rhodes Scholars, 1 Nobel Prize winner, 1 MacArthur Fellows program inductee, 4 recipients of the Harry S. Truman Scholarship, and 34 recipients of the Barry M. Goldwater Scholarship. USU has nine colleges and offers 159 undergraduate degrees, 83 master's degrees, and 41 doctoral degrees. USU's main campus is in Logan with regional campuses in Brigham City, Tooele, and the Uintah Basin and 28 other locations throughout Utah. 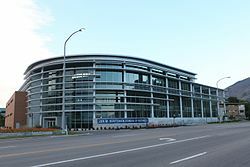 In 2010, the College of Eastern Utah, in Price, Utah joined the USU system becoming Utah State University College of Eastern Utah (USU Eastern). Throughout Utah, USU operates more than 20 distance education centers. Regional campuses, USU Eastern, and distance education centers account for 59% of the students enrolled. USU has 149,000 alumni in all 50 states and 110 countries. USU's athletic teams compete in Division I of the NCAA and are collectively known as the Utah State Aggies. They are a member of the Mountain West Conference. On December 16, 1861, Justin Morrill (VT) introduced a bill into the U.S. House of Representatives, "to establish at least one college in each state upon a sure and perpetual foundation, accessible to all, but especially to the sons of toil..." President Abraham Lincoln signed the Morrill Land-Grant Colleges Act into effect in July of the following year. Meanwhile, after visiting a few rural agricultural schools in his native Denmark, Anthon H. Lund of the Utah Territorial Legislature decided that there existed in Utah a need for such a school fusing the highest in scientific and academic research with agriculture, the way of life for the vast majority of locals. Upon returning to the states, Lund heard about the Morrill Act, and pitched a vision for the college that would receive widespread support among the Territorial Legislature, who was at the time seeking to reapply for statehood. Now there came the question of location. According to historian Joel Ricks in 1938, "Provo had received the Insane Asylum, Salt Lake City had the University and Capitol, and the majority of the legislature felt that the new institutions should be given to Weber and Cache Counties." Citizens in Logan, Cache County, banded together and successfully lobbied representatives for the honor. 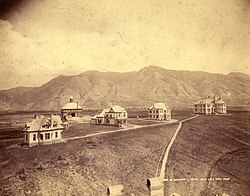 The bill to establish the Agricultural College of Utah was passed on March 8, 1888, and on September 2, 1890, 14-year-old Miss Vendla Berntson enrolled as its first student. In its early years, the college narrowly dodged two major campaigns to consolidate its operations with the University of Utah. Much controversy arose in response to President William J. Kerr's expansion of the college's scope beyond its agricultural roots. Detractors in Salt Lake City feared that such an expansion would come at the expense of the University of Utah, and pushed consolidation as a counter. In 1907, an agreement was struck to instead limit the curricula of the Agricultural College strictly to agriculture, domestic science, and mechanic arts. This meant closing all departments in Logan, including the already-impressive music department, which did not fall under that umbrella. Consequently, the University of Utah became solely responsible, for a time, for courses in engineering, law, medicine, fine arts, and pedagogy, despite the Agricultural College's initial charter in 1888 which mandated that it offer instruction in such things. The bulk of the curricular restrictions were lifted during the next two decades, with the exception of law and medicine, which have since remained the sole property of the University of Utah. Amid the tumult, the Agricultural College grew modestly, adding its statewide Extension program in 1914. A year later, the first master's degrees were awarded. UAC, as the Utah Agricultural College was commonly abbreviated, also received a notable boost in students as a direct result of World War I. Colleges and universities nationwide were temporarily transformed into training grounds for the short-lived Student Army Training Corps, composed of students who received military instruction and could then return to their educations following their military service. As the then-tiny campus could not otherwise support such large numbers of new students, college president Elmer Peterson convinced the state in 1918 to appropriate funds for permanent brick buildings, which could be used as barracks for SATC students during the war, and instruction afterward. Though the war was soon to end, the campus essentially doubled in size. The 1920s and 1930s saw the genesis of major growth. A School of Education was added in 1928, a prelude to the institution being renamed Utah State Agricultural College in 1929. Doctoral degrees were first granted in 1950. 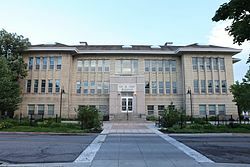 In 1957, the school was granted university status as Utah State University of Agriculture and Applied Science, but the short name Utah State University is used even in official documents. At the beginning of World War II, Utah State was one of six colleges selected by the United States Navy to give a Primary School in the highly unusual Electronics Training Program (ETP). Starting March 23, 1942, and each month thereafter, a new group of 100 Navy students arrived for three months of 14-hour days in concentrated electrical engineering study. Smart Gymnasium was converted to a dormitory, and Old Main was fitted out for classrooms and laboratories. Larry S. Cole was named Program Director and Waldo G. Hobson was the Director of Instruction. ETP admission required passing the Eddy Test, one of the most selective qualifying exams given during the war years. At a given time, some 300 Navy students were on the campus, greatly augmenting the war-years regular enrollment of 1000. Sidney R. Stock had earlier developed the Radio and Aviation Department, and entered the Navy as a Lieutenant Commander to assist in organizing electronics training. He was a member of the committee in Washington that planned the ETP, and shortly returned to Utah State as the Officer-in-Charge. The ETP Primary School continued at Utah State until August 1944, graduating about 2,750 students in 30 classes. During the late 1970s, controversy again erupted on campus surrounding the school's historically large Iranian population. As U.S. relations with Iran began to deteriorate throughout the decade, Iranian students on campus began staging protests against the Shah, which protests met with some backlash in the community. Following the outbreak of the hostage crisis of 1979, immigration officials arrived on campus to interview each Iranian, an event which alienated many international and domestic students. For a time, the population of Middle Eastern students declined sharply and has only recently begun to rise again. Toward the end of the 20th century, Utah State began taking more strides to shed its reputation as a small regional college and transform itself into a nationally prominent university. Under the auspices of President George Emert, who served at USU's helm from 1992 to 2000, the university's endowment increased from $7 million to $80 million. Scholarships, contracts, and grants increased substantially as well. Recently, especially under the tenure of former president Stan Albrecht, USU has forged collaborations with several foreign institutions and governments. The university is continuing to grow in terms of enrollment, endowment, and research. The Merrill-Cazier Library opened in 2005, and other facilities have followed. In 2010, USU acquired both the Swaner EcoCenter outside Park City as well as the former College of Eastern Utah, with its two campuses and various undergraduate and vocational programs. In 2012, the university successfully concluded a $400 million fundraising campaign—the largest ever at USU—which Albrecht said will go down in history as one of USU's most pivotal moments. As of 2016, the university's endowment was $325.3 million. USU Regional Campuses and USU Eastern provide education throughout the State of Utah. Distance Education centers and Extension sites exist in every county in Utah. As Utah's land grant university, the Utah State University system operates throughout the state of Utah. The earliest roots of USU's distance education go back to 1904 when USU professors traveled by train from Logan to Burley, Idaho to deliver dairy lectures. In the 1950s, professors regularly drove around the state to teach courses and advise students. The first regional campus, Uintah Basin, was designated by the Utah State Legislature in 1967. The next year, "flying professors" traveled weekly to teach at USU's various campuses and centers. Traveling to-and-from the centers was necessary until satellite systems were installed in 1996. In 2005, University President Stan Albrecht established USU Regional Campuses and Distance Education. The system grew in 2010 with the addition of USU Eastern to nearly one half of USU's enrollment. Today, the USU system includes the College of Eastern Utah, 3 Regional Campuses, 21 Distance Education centers, and 30 Extension sites. 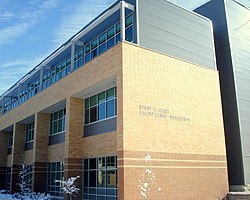 In 2012, RCDE completed construction of the Regional Campuses Distance Education (RCDE) Building which houses broadcast classrooms, RCDE offices, and the Utah Education Network. Located in Price, Utah, the former College of Eastern Utah joined the USU system in 2010 and became Utah State University College of Eastern Utah (USU Eastern). In 2013, the official name was shortened to Utah State University Eastern. USU Eastern operates a satellite campus, known as the Blanding campus, in Blanding, Utah. Before the merger, USU taught courses at the college through Regional Campuses and Distance Education (RCDE). USU Eastern is a junior college and offers associate degrees, certificates, and vocational programs. Bachelor's, master's and doctoral courses, however, are available on site through RCDE. USU Eastern competes as the Eastern Utah Golden Eagles and is the only campus besides Logan that has an athletics program. Regional Campuses and Distance Education (RCDE) work to fulfill USU's land-grant mission to increase access to a high quality education throughout the state of Utah. Growth of RCDE is outpacing that of the Logan campus with enrollment up 4.5% to 12,650 students enrolled in RCDE courses in 2011. 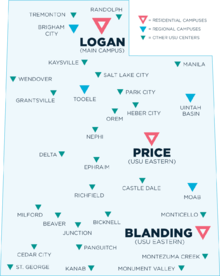 Regional campuses exist in Brigham City, Tooele, and the Uintah Basin (Vernal and Roosevelt). RCDE offers courses at Price and San Juan campuses that constituted the former College of Eastern Utah (now known as Utah State University Eastern). Distance Education operates 21 education centers throughout the state including Moab, Kaysville, Ephraim, Orem, and Salt Lake City. At each of these locations, students may receive a wide selection of degrees without ever stepping foot on the Logan campus. Courses and degrees are also made available online through Distance Education. USU has a growing presence in Moab, which had 295 students in 2011. The City of Moab committed up to $75,000 per year over the next 10 years to promote the development of the campus. Degrees specific to the needs of the community, including social work and recreation resource management, are planned for the new campus. Started in 1914, Utah State University Cooperative Extension, referred to simply as Extension, provides research-based, unbiased information to communities through their county offices and are an integral part of a land-grant institution. Extension operates 30 offices throughout the state, which include Swaner EcoCenter, Thanksgiving Point, and the Utah Botanical Center. With a focus on teaching, research, and public service, Extension programs include 4-H, agribusiness, Expanded Food and Nutrition Education, gardening and yard care, personal finance, and animal health. Utah State University's Quad during the summer. 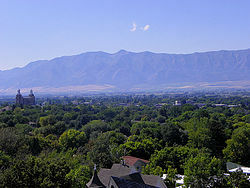 USU's main campus in Logan is situated on about 400 acres (1.6 km2), approximately one mile northeast of downtown Logan, at the mouth of Logan Canyon. The campus lies on a "bench," or shelf-like foothill overlooking the valley to the west. Mount Logan and the Bear River Range rise sharply to the immediate east. The campus contains more than 100 major buildings. Most student activity is centered around the south end of campus, which is home to the vast majority of academic departments, the Quad, the Taggart Student Center, and the Old Main building. Notable structures include Old Main, the college's first building, as well as the Merrill-Cazier Library, the 305,000 sq ft (28,300 m2) main university library, which houses more than 1,800,000 total volumes. 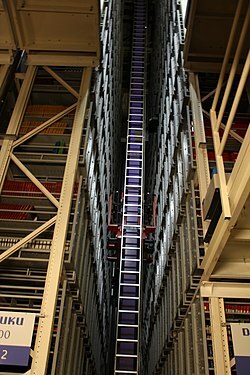 The library also boasts an extensive special collections and archives area, an automated storage and retrieval system, and more than 150 workstations and 33 group study rooms. Also notable is the Manon Caine Russell-Kathryn Caine Wanlass Performance Hall, said to contain some of the best acoustics in the entire Western United States. The Logan City Cemetery splits much of the campus in half. To the south lie most academic buildings, and to the west and north are situated the Dee Glen Smith Spectrum and Merlin Olsen Field at Maverik Stadium, respectively. Many scientific and agricultural research buildings are located even farther north. Nearby Logan Canyon is a popular recreation destination for students, with a system of trails and parks running along the river. In addition to camping and hiking, the canyon also serves as the primary route to nearby Beaver Mountain Ski Resort and Bear Lake. The university's Outdoor Recreation Program rents camping, water sports, mountain sports, and winter sports equipment to students, as well as providing them with area trail maps and expertise for their ventures into the canyon and elsewhere. 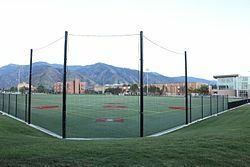 Students have access to Aggie Legacy Fields which are equipped with durable astroturf and lighting for after-dark activities. Utah State is the largest public residential campus in the state, and nearly 18,000 students live on or directly adjacent to campus. The university is the center of activity for the entire area, and the campus community is considered very close-knit. 21 widely varying on-campus buildings house single students, and 39 buildings on the north side of campus are available for married housing. 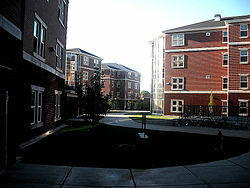 Many more students live in the multitude of off-campus housing options nearby. Students on campus may choose to dine in one of two cafeterias, as well as the Quadside Cafe at Merrill-Cazier Library which offers paninis, soups, beverages, and more. There is also a full-service Skyroom restaurant, and the Hub, which includes a number of dining options. On the east edge of campus sits Aggie Ice Cream, a local tourist hotspot dating back to 1888, which produces "world-famous" ice cream and cheese products, as well as sandwiches and soups. 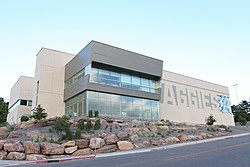 Utah State University's Aggie Recreation Center was completed in 2015. Starting out in Old Main, USU has had a creamery since its founding in 1888. Students studying dairying and domestic arts applied to learn how to make both ice cream and cheeses. In 1921, Gustav Wilster began working with the College of Agriculture, and by 1922, students were studying dairy technology, fluid milk processing, ice cream manufacture, dairy engineering, cheese manufacture, butter making, dairy facility inspection, and dairy product judging. Wilster's students would go on to create Casper's Ice Cream, Farr's Ice Cream, and Snelgrove's Ice Cream. In 1975, the Nutrition and Food Sciences building was built, which is where Aggie Ice Cream is housed today. Aggie Ice Cream receives its milk from the Caine Dairy Research and Teaching Center located near the Wellsville Mountains. Along with Aggie Ice Cream, well-known traditions include the rite of passage of becoming a True Aggie, which requires a student to kiss someone who is already a True Aggie on top of the Block "A." Two students may also become True Aggies together on Homecoming night or on A-Day. At one point recently, USU held the title in the Guinness Book of World Records for the most couples kissing at the same place at the same time. Nearby the Block "A" is the lighted "A" atop the Old Main tower, which shines white throughout the entire valley, and blue on nights when a varsity sport has picked up a victory, or other special events have occurred on campus. Every student at Utah State is represented by the USUSA (Utah State University Student Association) which is composed of 17 elected student officers and 5 appointed student officers. These officers typically oversee a certain area of responsibility that is outlined in each officer's charter. Responsibilities of USUSA officers can range from overseeing campus events and activities to promoting and advocating for particular initiatives at the Utah State Legislature. In February of each school year, campaigns are launched by students who wish to serve in the following year's USUSA. Campaigns last one week and consist of a primary and general election in which the top two vote-getters from the primary advance to the general election and the candidate who receives a majority vote in the general election is announced as the winner. The USUSA received significant attention during the 2016-2017 school year when the organization declared a mental health crisis at Utah State University. The legislation (written by USUSA Student Body President Ashley Waddoups, USUSA Student Advocate Vice President Matthew Clewett, and USUSA Graduate Studies Senator Ty Aller) sought to raise awareness of significant wait times for students to utilize CAPS (Counseling and Psychological Services) at Utah State as well as the increasing number of students who were suffering from mental health related illnesses. After a successful lobbying campaign, the USUSA was able influence the Utah State Legislature to pass a resolution declaring a mental health crisis at all USHE (Utah System of Higher Education) institutions. The resolution was subsequently signed by Utah Governor Gary Herbert in March 2017. 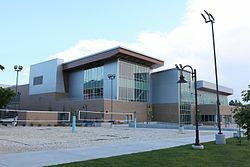 Students have full access to the HPER (pronounced "hyper"), Nelson Fieldhouse, and the ARC (Aggie Recreation Center) exercise facilities which include basketball courts, indoor rock climbing, gymnastics equipment, two swimming pools, racquetball, squash, and outdoor field space for lacrosse, rugby, soccer, ultimate, and other sports. USU students are also involved in more than 100 clubs, an active and influential student government, seven fraternities and three sororities, multiple intramural and club sports, and a student-run radio station. In 1970, Utah State student Sue Brown and Director of Student Activities Val R. Christensen created one of the first service organization in the nation. VOICE, Volunteer Organization for Involvement in the Community and Environment, worked to improve the environment and social issues in Cache Valley. VOICE became The Val R. Christensen Service Center in 1999 in honor of Dr. Christensen’s efforts and support of the organization. Today, students are involved in more than 20 service organizations including Aggie Special Olympics, Aggies for Africa, Alternative Breaks, and Senior University. Founded in 1888, Utah State University is the agricultural college and land grant institution for Utah. 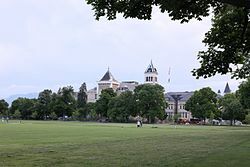 In 1903, USU was divided into five schools: the School of Agriculture, the School of Agricultural Engineering and Mechanical Arts, the School of Home Economics, the School of General Science, and the School of Commerce. In 1907, the State of Utah prohibited USU from providing degrees in teaching and engineering (to prevent competition with the University of Utah). In 1923, the University expanded to six academic colleges: Agriculture, Home Economics, Agricultural Engineering, Commerce and Business Administration, Mechanic Arts, and General Science. In 1924, the institution added a School of Education, and restructured the School of General Science to include a School of Basic Arts and Sciences. Formerly existing as a non-degree-granting institution within the College of Humanities, Arts & Social Sciences, the Caine College became a free-standing college on July 1, 2010. The Caine College of the Arts houses the departments of Art & Design, Music, and Theatre Arts, along with the Nora Eccles Harrison Museum of Art. 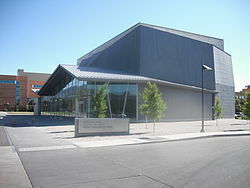 Performance facilities include the Chase Fine Arts Center, which houses the Kent Concert Hall among other venues, and the free-standing Manon Caine Russell-Kathryn Caine Wanlass Performance Hall, completed in 2006. The 400-seat Performance Hall, designed by the architectural firm Sasaki Associates, has been praised as one of the best acoustic performance spaces in the American West, and received an Honor Award from the Utah Chapter of the American Institute of Architects. The Nora Eccles Harrison Museum of Art, designed by architect Edward Larrabee Barnes and opened in 1982, contains one of the largest art collections in the Intermountain Region. Its holdings include nationally significant collections of ceramics, Native American art, and especially artworks produced in the American West since 1945. USU's music program includes faculty Dean Craig Jessop, longtime director of the Mormon Tabernacle Choir, as well as opera singer Michael Ballam, pianist Gary Amano, and the Fry Street Quartet, USU's string quartet-in-residence. The College of Agriculture and Applied Sciences was the first academic college at USU, and is known for ground-breaking animal genetics and human nutrition and food science research, as well as other significant breakthroughs and global outreach in plants and soil science, animal science, veterinary science and economics and applied agriculture. College researchers were instrumental in the creation of the first cloned equines (horses), in a project collaboration with researchers at the University of Idaho. The college is also a leader in the international project to classify and research the sheep genome. The College of Agriculture includes six departments: Applied Sciences, Technology & Education (Aviation Technology); Animal, Dairy & Veterinary Sciences; Applied Economics; Landscape Architecture and Environmental Planning; Nutrition, Dietetics & Food Sciences; and Plants, Soils & Climate. The College is also home to Utah's first Doctor of Veterinary Medicine (DVM) program. The program is a regional program in collaboration with Washington State University in Pullman, Washington. Each year, the program accepts 20 Utah residents and 10 non-Utah residents. Students spend their first two years receiving pre-clinical training at USU’s Logan campus. They spend the final two years at WSU’s College of Veterinary Medicine in Pullman, Washington completing the clinical portion of their veterinary education. The College is also known for the production of its nationally known, award-winning Aggie Ice Cream and cheeses, through its Nutrition and Food Science Department. In 2013 the name of the College was changed from the College of Agriculture to the College of Agriculture and Applied Sciences to reflect the broad nature of the college. Much of USU's most widespread academic renown stems directly from the College of Engineering. 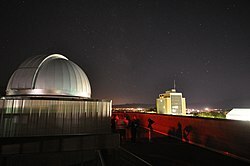 USU houses the Space Dynamics Laboratory (SDL) which is a research facility focusing on military and science applications. The SDL frequently submits projects to the Department of Defense and NASA. According to recent National Science Foundation statistics, USU ranked first among all universities in the U.S. in funding for aerospace research. USU has also won multiple national aerospace engineering competitions in the past, including two in the 2008–09 academic year alone. The Utah Water Research Laboratory is the oldest and largest facility of its kind in the nation. USU is considered the world's No. 1 university in a number of water-related engineering and scientific disciplines due in large part to the UWRL. The lab heads and contributes to numerous international projects, particularly in arid Middle Eastern nations. The Ray B. West Building houses the College of Humanities and Social Sciences' Department of English. The College of Humanities and Social Sciences touches nearly every student on campus through its teaching of required general education classes. The College houses eight departments and more than 30 programs. Departments include English, history, journalism and communication, languages, philosophy and speech communication, military science, political science, sociology, social work and anthropology. In the Humanities, USU has long history in the study of the American West. 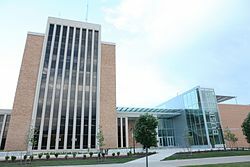 The university, through its departments of English and history, respectively, is the host institution for the scholarly journals Western American Literature and the Western Historical Quarterly, the official publications of the Western Literature Association and the Western History Association, respectively. The Mountain West Center for Regional Studies, a Humanities outreach center at USU, sponsors public events and research focusing on the cultures and history of the Interior West and larger American West. University Special Collections and Archives, located at the Merrill-Cazier Library, has extensive archival holdings documenting the histories of Utah, the Intermountain West, and The Church of Jesus Christ of Latter-day Saints, as well as one of the nation's largest collections pertaining to American folklore, and the lives and works of western authors such as Jack London and poet May Swenson, a Logan native and USU alumna. The college also houses the USU Museum of Anthropology, currently located in Old Main. Among the most notable aspects of USU's College of Science includes the rate at which its students are accepted into medical and dental schools. Despite the absence of such professional schools on site in Logan, students are admitted to medical and dental programs at a rate of nearly 30 percent above the national average each year. This is due in large part to the rigorous Prehealth Advising Program and resources like the Cadaver Lab, to which undergraduates have access. In the past decade, the Physics Department alone has produced a Rhodes Scholar, a Marshall Scholar, a Fulbright Student Scholar, nine Goldwater Scholars, and two Carnegie Professors of the Year. The College of Science houses the Departments of Biology, Chemistry & Biochemistry, Physics, Computer Science, Mathematics & Statistics, and Geology. The Department of Mathematics & Statistics includes one of only three actuarial science programs in the American West. USU's Emma Eccles Jones College of Education and Human Services was founded in 1924. With around 5,700 students, the College has been placed in the top 2% of the U.S. News and World Report best graduate schools of education in the U.S. for the past decade. The college ranks 4th nationally in external funding for all colleges of education. The college is accredited by the American Psychological Association. Faculty are active in many of areas of research, including neuropsychology, child development, health psychology, behavior therapy, and quantitative psychology. The college has a nationally recognized department of Instructional Technology and award-winning faculty in the area of learning sciences. The Department of Special Education and Rehabilitation is ranked in the top 10 nationally according to US News & World Report. Department of Psychology professor Karl R. White is director of the National Center for Hearing Assessment and Management, which focuses on the early identification and intervention of hearing loss in infants and young children. USU is the only university in the state of Utah to have a Housing & Financial Counseling program offered through the college's department of Family, Consumer, and Human Development. This program offers debt counseling, budget counseling, mortgage default prevention counseling, and reverse mortgage counseling through the USU Family Life Center, which also houses the Marriage & Family Therapy Clinic. The Jon M. Huntsman School of Business' north-facing entrances. The Jon M. Huntsman School of Business completed construction on its expansion in 2016. In 2007, Utah State's College of Business became the Jon M. Huntsman School of Business after a $26 million donation by the philanthropist Jon Huntsman, Sr. The Huntsman School of Business is the West's oldest continuously operating business college. It offers a number of graduate and undergraduate degrees in fields including management, accounting, economics, finance, and management information systems (MIS). The bachelor's degree in international business is unique to USU within the state. The prestigious School of Accountancy is distinguished by perennial Top 5 rankings in CPA exam scores by its grad students. In 2014, 75.3% of its students passed the CPA exam placing the program 21 out of 254 institutions in the nation under the large programs classification. U.S. News & World Report ranked the Huntsman School 183 nationally for business programs. Its Institute of Management Accountants chapter has received a "Gold Level Award of Excellence" for each of the past 14 years essentially making it the top such institute in the nation. The Huntsman School widely touts its travel programs, including the unique Huntsman Scholar Program, and the impressive transformation it is undergoing as it puts its new resources to use. This effort has included the hiring of high-profile faculty, such as Stephen R. Covey, influential management scholar and author of the wildly popular best-seller The Seven Habits of Highly Effective People. Covey taught classes from 2010 until his death in 2012. The Huntsman School of Business also houses the Shingo Institute, an outreach program that develops executive education to be licensed and taught to leaders of organizations worldwide. The Shingo Institute also administers the internationally recognized award, the Shingo Prize for Operational Excellence. 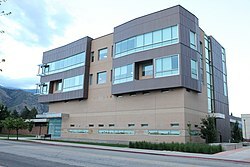 In 2011, the Utah Legislature approved funding for a new business building to be located south of the Eccles Business Building. The new building was funded by $36 million in private funds and $14 million in state funds. The 117,000-square-foot (10,900 m2) building was completed in 2016 and includes classrooms, faculty offices, a business library and three new business centers. USU has a long and illustrious history in the science and management of forests, rangeland, wildlife, and fisheries and watersheds. Many graduates of the Quinney College of Natural Resources have gone on to high-level careers in the National Forest Service, National Park Service, and the Bureau of Land Management, and its graduate programs attract high numbers of international students. The college also operates the Quinney Library, which houses collections relevant for natural resources education, management, and research. The college was formally renamed the S.J. and Jessie E. Quinney College of Natural Resources in 2012 after a $10 million donation was received by the S.J. and Jessie E. Quinney Foundation. The Quinneys were both graduates of USU (then the Agricultural College of Utah), and their foundation has supported the College of Natural Resources for 40 years, contributing more than $40 million in all. The Quinney College of Natural Resources includes the departments of Watershed Sciences, Environment and Society, and Wildland Resources. As of Fall 2015, Utah State University enrolled 28,622 of whom 25,259 were undergraduate students and 3,363 were graduate students. 17,901 of these students were enrolled at USU's Logan campus while 10,721 students were enrolled exclusively at regional campuses or in distance education. USU is home to more Carnegie Professors of the Year than any other school in Utah, and boasts nine of the last 15 for the state. The Carnegie is a teaching award, and in fact, USU strongly stresses close undergraduate involvement for even their most prestigious faculty. According to a recent survey, 49.7% of all faculty teach undergraduates, and 63.5% say they've worked with an undergraduate on a research project in the last two years. The university is accredited by the Northwest Commission on Colleges and Universities. USU is also home to a dynamic and successful Honors Program. Student to Faculty ratio at Utah State University is 21.5 to 1. Admittance rate, that is the percentage of total applicants that are admitted, is 97%. SAT composite range for the students is 970-1240. ACT composite range for the students is 20-27. As reported by Forbes in 2015, the annual cost for a student at USU is $30,100, which is approximately half compared to costs at an Ivy League university such as Harvard ($62,250), Yale ($63,970) or Princeton ($58,965). The student to faculty ratio at USU is 21.5; this is considerably higher than the ratio at Ivy League schools, where student to faculty ratio is between 6 and 7 (i.e., 6 to 7 students per faculty member). U.S. News & World Report ranked USU No. 14 for Best Online Bachelor's Programs in 2017. The Princeton Review has ranked Utah State among the "Best Western" schools for many years, and Popular Science called it one of the Top 10 Smartest Schools in the nation. "Forbes" ranked the university No. 95 in Public Colleges, No. 137 in Research Universities, and No. 65 among colleges in the West. The university also leads the nation in funding for aerospace research and the number of student experiments actually sent out into space. Various entities within the university have received high departmental rankings, such as the Emma Eccles Jones College of Education and Human Services, which ranks 2nd in the nation for total research dollars received by any one college, and in the top 2% for all graduate colleges of education. The athletics program recently won a National Championship for most sports success per dollar spent. By way of research and development expenditures, Utah State University is ranked No. 79 in the nation among public universities by the National Science Foundation. In 2017, Utah State University was ranked No. 1 in the nation by MSN among 1,600 considered schools "based on affordability, flexibility, and other quantitative factors." Cache County, in which USU is located, had an estimated 120,783 residents in 2015 of whom 17,901 residents or 14.8% were Utah State University students. Cache County had a median household income of $50,367 as of 2014 and the U.S. had a median household income of $53,657 during the same year. Cache County's per capita income was $20,195 and the United States' per capita income was $28,889 in 2014. Cache County reported a higher-than-national-average 3.14 persons per household in 2014 during which the U.S. average was average was 2.63. Despite a reported median household income that was 6.1% less than the national median in 2014, Cache County is said to be safe. It is ranked as the No. 1 safest U.S. metropolitan area, No. 7 "Safest College Campus in the United States," No. 3 in "Best Cities to Find a Job", and No. 10 in "Best Small Places for Business and Careers". Observatory built in 2009 on top of the SER building. For dept. of Physics and public use, it houses a 20-inch (510 mm) reflecting telescope. Utah State University is classified by the Carnegie Foundation for the Advancement of Teaching as a research university with "high research activity." The National Science Foundation ranked USU 115 in the nation and 2 in Utah for research and development expenditures having recorded $164.8 million in 2014. As of 2016, USU received more than $240 million is research support. In addition to its faculty and graduate work, the university strongly emphasizes the importance of undergraduate research. USU's Undergraduate Research program was founded in 1975 making it the second program of its kind in the nation with Massachusetts Institute of Technology founding the first. Along with the University of Utah, USU is an anchor in the Utah Science Technology and Research (USTAR) program, which is aimed at optimizing the university and region's most marketable strengths with the goal of bolstering Utah's high-tech economy. Seven USTAR teams currently perform research at Utah State. USTAR and USU's Advanced Transportation Institute developed charging technology for electric buses. Now, buses can be powered through wireless induction technology. The bus stops over magnetic pads that will charge the bus while passengers load and unload. A prototype of the technology began service on the University of Utah campus in 2012.
Notable research centers based at USU include the Space Dynamics Laboratory, Energy Dynamics Laboratory, Utah Water Research Laboratory, Center for High Performance Computing, Utah Climate Center, Center for Advanced Nutrition, Center for the School of the Future, National Aquatic Monitoring Center, Intermountain Center for River Rehabilitation and Restoration, Mountain West Center for Regional Studies, and Utah Botanical Center, among others. In 2010, the university received ownership of the more than $30 million Swaner Preserve and EcoCenter outside of Park City. The center consists of a 1,200-acre (4.9 km2) land trust and a 10,000-square-foot (930 m2), state-of-the-art facility dedicated to environmental education. The preserve protects critical wetland and foothill terrain in the heart of one of the state’s fastest-growing areas, and the EcoCenter, completed in 2009, is a multi-use facility with space for educational and community activities. The facility is LEED Platinum Certified, the highest standard for design, construction and operation of high-performance green buildings. Through the Department of Physics (College of Science), Utah State University has placed more student experiments into space than any educational institution in the world. A team of USU and University of Idaho researchers were the first in the world to successfully clone an equine. The baby mule, named Idaho Gem, was born May 4, 2003. USU researchers made headlines in 2011 after breeding transgenic goats. Utah State University professor Randy Lewis' "spider goats", the milk of which contains spider silk, are being studied for uses including human muscle tissue and light-weight bulletproof vests. Research efforts are underway to produce a cost-competitive bio-diesel from algae. Lance Seefeldt and other professors formed the Biofuels Program at Energy Dynamics Laboratory to develop new and emerging technologies that will produce methane, biodiesel, hydrogen and alcohols from renewable, carbon-dioxide-neutral energy sources, such as consumer and agricultural waste and sunlight. Dallas Hanks, a doctoral student, has initiated a program at the university called FreeWays to Fuel, which is growing oilseed crops for biodiesel in previously unused municipal land such as highway roadsides. Hanks estimates that in the U.S., 10 million acres (40,000 km2) of such unused land exists—land which generally serves no other purpose and currently costs tax dollars to maintain. Early yields from the crops are promising, and the program has spread to other land-grant universities across the nation. He has a goal to produce 50 million US gallons (190,000 m3) of biofuel in five years. Utah State University promotes the OpenCourseWare (OCW) Project (open and free university courses) and is developing an open content management system for OCW called eduCommons. This open source content management system is one of the important technology projects in the MIT OpenCourseWare Initiative. eduCommons aids in the creation of OCW sites and has already been adopted by several universities for this purpose. Utah State University supports organized athletics within the three categories of varsity intercollegiate, club intercollegiate, and intramural. Since its founding in 1888, USU's varsity and club sports and its players have won a combined 16 national championships. The men's basketball team plays in the Dee Glen Smith Spectrum, which has been named among the nations "15 Toughest Places To Play In College Basketball." ESPN has also named USU's student section, The HURD, among the smartest in the nation. During the 2008–09 season, USU's ranking in the ESPN/USA Today Coaches' Poll rose as high as #17. USU basketball was 193–13 (.937) at home during the Stew Morrill era, having received 6 NCAA Tournament berths in between 2000 and 2010, and amassed more wins than any team in the nation except Duke, Kansas, and Gonzaga during that time. Tim Duryea was named the head coach for men's basketball prior to the team's 2015–2016 season. Utah State University's Women's Volleyball team plays in the Wayne Estes Center. USU's football team is one of 128 schools in the Division I Football Bowl Subdivision (FBS) of the National Collegiate Athletic Association (NCAA) in the United States. After many years of futility in football, USU rose to new heights under head coach Gary Andersen, ending the 2012 regular season with its USU's first-ever 10-win season, its first Western Athletic Conference championship in football, and nationwide Top 25 rankings in all three major polls. In addition to Andersen's hiring, the football program's renaissance can be attributed in part to a recent emphasis, under Athletics Director Scott Barnes, on recruiting, TV coverage, fundraising, facilities upgrades, and internal reorganization, despite the athletics department's dismal budget in comparison with other state and WAC schools. In recognition of these efforts, USU Athletics was crowned the 2009 National Champion of the Excellence in Management Cup, which seeks to identify the university that wins the most championships with the lowest expenses. Matt Wells was named head coach of USU's football team prior to the 2013–2014 season. The Aggies were members of the WAC between 2005–2012, and the men's teams won several conference championships in that time, including football in 2012, basketball in 2008, 2009, 2010, and 2011, indoor track in 2008, 2010, 2011, outdoor track in 2007, 2009, 2010, and 2011, cross country in 2005, 2006, 2007, 2008, 2009, and 2011. Women's teams also won WAC championships including volleyball in 2012, soccer in 2008, 2010, 2011, and 2012, cross country in 2006 and 2008, outdoor track in 2012 and indoor track in 2012. Utah State has won numerous conference championships in previous conferences. National championships include women's volleyball in 1978 and softball in 1980 and 1981. As members of the Mountain West Conference, the Aggies have claimed a division title in football and played in the inaugural Mountain West Championship Game in 2013. The men's tennis team won the regular season Mountain West Conference championship in 2016. The men's tennis team won both the Mountain West Conference regular season and tournament championships in 2017. Intramural sports are offered to students, faculty, and staff. Journals published by the university include Utah Science, Western Historical Quarterly, and Western American Literature. The Utah State University Press publishes works in composition studies, folklore, Mormon history, Native American studies, nature and environment, and western history. The Utah Statesman, or simply The Statesman, and Hard News Cafe are the primary news outlets that serve the USU student body. The Statesman is a student-run paper with a faculty adviser. The paper is funded partly by a student fee of $2 per semester and partly by the sale of advertisements. The Statesman is published twice a week and distributed free of charge on campus and to certain off-campus USU offices. The Statesman won the Society for Professional Journalist's Best Column Writing award in 2002 and Best Non-Daily Student Paper in 2005. Hard News Cafe is a news website operated by USU's Department of Journalism and Communications. Utah Public Radio, based at the university in the MDLS building, is heard on KUSU (91.5 FM) and KUSR (89.5 FM) in Logan, and throughout Utah on a system of 26 translators. UPR broadcasts "a mix of information, public affairs, and fine arts programming." KUSU is a National Public Radio member station, and an affiliate of Public Radio International. In addition, an entirely student-run radio station called Fusion HD3 broadcasts on the third HD channel of 89.5 in Cache Valley and online. Aggie Television (ATV) is a cable service lineup of approximately 110 channels offered free of charge to all on-campus residents. ATV produces Crossroads, a bulletin/announcement channel; and Aggie Advantage, providing local and student video programming. On June 13, 1899, graduates of the Agricultural College of Utah met to create the Alumni Association. Today, the Alumni Association is located in the historic David B. Haight Alumni Center, which was dedicated July 11, 1991. Alumni chapters exist in Arizona, California, Colorado, Idaho, Nevada, Oregon, Utah, Washington, and Washington, D.C. USU boasts more than 220,000 alumni living in all U.S. states and more than 100 countries. Particularly notable alumni include Harry Reid, former U.S. Senate Majority Leader; Lars Peter Hansen, one of the three Americans to win the 2013 Nobel Prize in Economic Sciences; May Swenson, poet; Merlin Olsen, pro football hall-of-famer, actor, and TV personality; Ardeshir Zahedi, former Iranian Foreign Minister and Ambassador to the U.S. under the Shah of Iran Mohammad Reza Shah; Chris Cooley, pro-football tight-end for the Washington Redskins; Mary L. Cleave, NASA astronaut, and Bobby Wagner, a linebacker for the Seattle Seahawks. Particularly notable faculty include Stephen R. Covey, author of The Seven Habits of Highly Effective People; Michael Ballam, renowned tenor and general director of the Utah Festival Opera; Don L. Lind, NASA Astronaut and member of "The Original 19"; George Dewey Clyde, Governor of Utah; Christopher Cokinos, award-winning poet and nonfiction writer; Hugo de Garis, artificial intelligence researcher; Rainer Maria Latzke, mural and fresco painter, and founder of the Institute of Frescography; David Peak, physicist, Utah Carnegie Professor of the Year, and mentor to 1 Rhodes and 7 Goldwater Scholars; Richard Powers, American novelist and author of The Echo Maker; and Joseph Tainter, anthropologist and historian. ^ a b c d e f "Utah State University Fast Facts". Usu.edu. February 1, 2005. Retrieved January 20, 2018. ^ "U.S. and Canadian Institutions Listed by Fiscal Year (FY) 2018 Endowment Market Value and Change* in Endowment Market Value from FY17 to FY18". nacubo.org. Retrieved March 9, 2019. ^ "2018 Annual Financial Report" (PDF). usu.edu. Utah State University. Retrieved March 9, 2019. ^ "Noelle Cockett Named Utah State University President". Utah State University. Retrieved January 7, 2017. ^ "Provost's Office Staff". www.usu.edu. Retrieved March 25, 2019. ^ a b c d e f g h "Utah State University Fast Facts". Utah State University. Retrieved January 7, 2017. ^ Tanner, Courney (October 4, 2018). "VU enrollment bulges to nearly 40K. State now has nearly as many college students as population of Salt Lake City". The Salt Lake Tribune. Retrieved October 4, 2018. ^ "Utah State University Visual Identity Program" (PDF). February 10, 2015. Archived from the original (PDF) on April 17, 2016. Retrieved June 17, 2016. ^ "Directory of Institutions S — U". North West Commission on Colleges and Universities. Archived from the original on January 5, 2016. Retrieved June 11, 2016. ^ "Percentage of out-of-state students at public universities". Retrieved June 11, 2016. ^ "Academics at Utah State University". Retrieved June 11, 2016. ^ "Degree Finder". Retrieved June 14, 2016. ^ a b c "History and Traditions". Utah State University. ^ "2015 Update Facts & Figures" (PDF). The Carnegie Foundation. Retrieved June 13, 2016. ^ "Utah State University". Retrieved June 13, 2016. ^ "USU Grad Danielle Babbel Among Rhodes Scholar Finalists". Utah State Today. Retrieved June 11, 2016. ^ "Lars Peter Hansen – Biographical". NobelPrize.org. Retrieved June 11, 2016. ^ "MacArthur Fellows: Where fellows received undergraduate degrees" (PDF). MacFound.org. Retrieved June 11, 2016. ^ Opsahl, Kevin (April 25, 2016). "USU student fourth in 36 years to receive Truman Scholarship". The Herald Journal. Retrieved June 19, 2016. ^ "Utah State University Student Awarded Prestigious Truman Scholarship". Utah State Today. Utah State University. Retrieved June 19, 2016. ^ "Barry M. Goldwater Scholars". Archived from the original on August 20, 2016. Retrieved June 11, 2016. ^ a b "Colleges and Schools". Retrieved June 12, 2016. ^ a b "Utah State University Quick Facts". usu.edu. Utah State University. Retrieved February 4, 2018. ^ a b "BROWSE DEGREES". usu.edu. Utah State university. Retrieved February 4, 2018. ^ "Colleges and Schools". usu.edu. Utah State University. Retrieved February 4, 2018. ^ a b "USU Regional Campuses". Retrieved June 11, 2016. ^ "USU and CEU Create Historic Union". Retrieved June 11, 2016. ^ "Regional Campuses". regionalcampuses.usu.edu. Utah State University. Retrieved February 4, 2018. ^ "The Morrill Acts of 1862 and 1890". 1890 Universities. Retrieved June 11, 2016. ^ "150 Years Of Learning And Discovery". Archived from the original on August 20, 2016. Retrieved June 11, 2016. ^ "The New U of U, 1892–1914". University of Utah. Retrieved June 12, 2016. ^ "Annual Report of the Commissioner of Education, Volume 2". United States. Office of Education. 1908. Retrieved June 12, 2016. ^ Parson, Robert. "Encyclopedic History of Utah State University". Utah State University Digital Commons. Utah State University. Retrieved June 12, 2016. ^ "Brief History of Extension at USU" (PDF). USU Extension. Archived from the original (PDF) on September 11, 2017. Retrieved June 12, 2016. ^ a b c Parson, Robert. "An Encyclopedic History of Utah State University". Utah State University. Archived from the original on June 20, 2010. Retrieved December 20, 2011. ^ Peterson, F. Ross. "Utah State University". UEN.org. Archived from the original on January 13, 2017. Retrieved June 12, 2016. ^ "Student Army Training Corps". Illinois College. Retrieved June 12, 2016. ^ "History". Retrieved June 12, 2016. ^ Shaver, James. "It's About People: Emma Eccles Jones College of Education and Human Services, Utah State University, 1990–2009". Utah State University Digital Commons. Retrieved June 12, 2016. ^ "CPD History Timeline". CPD. Retrieved June 12, 2016. ^ Watson 2007, pp. 202–215. ^ Lambert, Karen. "Utah State alma mater of hundreds of Iranians". The Herald Journal. Retrieved June 12, 2016. ^ "A Peru Company, Danper, that Partnered with USU Students to Offer Small Business Loans and Training, Has Won First Place from World Business Council for Sustainable Development in Peru". Huntsman News. Retrieved June 12, 2016. ^ "USU Aviation Program Welcomes Gift -- and Students -- From Saudi Airlines". Utah State Today. Retrieved June 12, 2016. ^ "China Cooperative Academic Programs". Retrieved June 12, 2016. ^ Carr, Jeff (Fall 2009). "President Stan L. Albrecht: Five Years In". Utah State Magazine. 15 (3). ^ Vitale, Tim (January 15, 2010). "Swaner Preserve & EcoCenter Makes Largest Gift in USU's History". Retrieved June 12, 2016. ^ Thayne, Jared (Summer 2007). "Honoring Tradition, Securing Our Future: The Campaign for Utah State University". Utah State Magazine. 13 (2). ^ "U.S. and Canadian Institutions Listed by Fiscal Year (FY) 2016 Endowment Market Value and Change* in Endowment Market Value from FY2015 to FY2016" (PDF). National Association of College and University Business Officers. Archived from the original (PDF) on February 15, 2017. Retrieved March 26, 2017. ^ a b c d e "2011 Annual Report" (PDF). Utah State University. Archived from the original (PDF) on February 2, 2013. Retrieved February 4, 2013. ^ Ottley, Kristi. "RCDE's steel, concrete HQ to expand USU's virtual and online presence". Hard News Cafe. Retrieved June 14, 2016. ^ "USU and CEU Create Historic Union". Retrieved June 14, 2016. ^ "History". USU Eastern. Retrieved June 18, 2016. 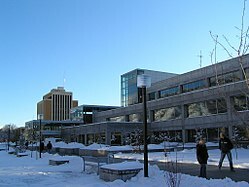 ^ "Utah State University Eastern – Blanding Campus". Utah State University Eastern – Blanding Campus. Retrieved June 18, 2016. ^ Opsahl, Kevin (April 29, 2016). "USU Eastern sees big changes in athletics". newspaper. The Herald Journal. Retrieved June 19, 2016. ^ "Founders Day 2012: Happy Birthday Utah State University". Utah State Today. Retrieved June 19, 2016. ^ "Enrollment Summary Fall 2011" (PDF). Utah State University. Archived from the original (PDF) on April 7, 2012. Retrieved October 21, 2011. ^ "Regional Campus and Center Locations". Utah State University. Retrieved September 29, 2011. ^ "Delivery Types". Utah State University. Archived from the original on November 20, 2011. Retrieved November 6, 2011. ^ Holtby, Travis (April 24, 2013). "One less roadblock to new USU campus". newspaper. Moab Sun Times. Retrieved June 19, 2016. ^ "About Us". Extension. Retrieved June 19, 2016. ^ "County Offices". Utah State University. Retrieved September 29, 2011. ^ "About Us". Utah State University. Archived from the original on October 13, 2011. Retrieved September 29, 2011. ^ "USU Graphic Campus Map" (PDF). Retrieved June 19, 2016. ^ "Accreditation". Retrieved June 19, 2016. ^ "Library Portrait: Overview of Merrill-Cazier Library Facilities, Services, and Collections". Utah State University. Archived from the original on February 10, 2010. Retrieved January 15, 2010. ^ a b c d e f Utah State University Visitor's Guide 2009–2010. Logan, UT: Utah State University. 2009. ^ a b ArchNewsNow (August 8, 2006). "Fine Tuning: Utah State University Performance Hall by Sasaki Associates". ArchNewsNow.com. Retrieved January 12, 2010. ^ "USU Outdoor Recreation Program". Utah State University. Retrieved May 23, 2012. ^ "USU Housing Services". Utah State University. Retrieved January 15, 2010. ^ "USU Dining Services". Utah State University. Retrieved January 15, 2010. ^ "Aggie Ice Cream". Utah State University. Retrieved January 15, 2010. ^ a b c McMahon, Donald J. "Famous Aggie Ice Cream" (PDF). Utah State University Aggie Ice Cream. Archived from the original (PDF) on October 30, 2011. Retrieved October 17, 2011. ^ "Store Locations". Archived from the original on July 30, 2016. Retrieved June 19, 2016. ^ "'True Aggie Night' is a long time tradition at USU". ABC4 Utah. ABC4 Utah. April 23, 2016. ^ "True Aggie". Retrieved June 19, 2016. ^ Schwab, Kelsey. "USU athletes light the A blue". The USU Statesman. Retrieved June 19, 2016. ^ "USU student government declares mental health crisis". KSL. KSL. September 7, 2016. ^ "HCR 16 – Utah State Legislature 2017". Utah State Legislature. Retrieved May 10, 2017. ^ "ASUSU—Associated Students of Utah State University". Utah State University. Retrieved January 15, 2010. ^ "About The Service Center". Retrieved June 19, 2016. ^ "Val R. Christensen Service Center Restructuring" (PDF). Retrieved June 19, 2016. ^ "Val R. Christensen Service Center". Utah State University. Archived from the original on January 11, 2011. Retrieved December 14, 2010. ^ "Schools of Columbia University". Columbia University. Retrieved June 20, 2011. ^ "The Land Grant Tradition". APLU.org. Association of Public and Land-Grant Universities. Retrieved June 19, 2016. ^ "Colleges and Departments". Utah State University. Retrieved December 21, 2011. ^ Williams, Patrick (January 15, 2010). "Utah State University Creates New College". Utah State Today. Retrieved January 18, 2010. ^ "Departments & Programs, Caine School of the Arts". Utah State University. Archived from the original on November 6, 2011. Retrieved December 20, 2011. ^ "Performance Hall Merits Honor". Utah State Today. October 11, 2007. Retrieved June 19, 2016. ^ "About the Museum". Archived from the original on June 10, 2016. Retrieved June 19, 2016. ^ "Department of Music". Utah State University. Retrieved January 27, 2010. ^ Black, Richard (May 29, 2003). "Cloning First for Horse Family". BBC. Retrieved January 12, 2010. ^ Cockett, Noelle E. "Continuing the Development of Sheep Genomics Resources" (PDF). SheepHapMap.org. Retrieved June 19, 2016. ^ "Aviation Technology". Retrieved September 22, 2016. ^ "WIMU Regional Program in Veterinary Medicine". Retrieved June 19, 2016. ^ "USU's new veterinary program off and running". The Herald Journal. Retrieved October 7, 2012. ^ "History". Retrieved June 19, 2016. ^ Werner, Debra. "Profile: Niel Holt, Director, Utah State University's Space Dynamics Laboratory". SpaceNews.com. Retrieved June 19, 2016. ^ "NASA Partners With Utah State University's Space Dynamics Lab". NASA. Goddard. Retrieved June 19, 2016. ^ "Contracts: Navy". U.S. Department of Defense. May 25, 2016. Retrieved June 19, 2016. ^ a b "Utah State No. 1 in Nation for Space Research Funding" (Press release). Space Dynamics Laboratory/Utah State University. November 3, 2006. Archived from the original on November 23, 2009. Retrieved January 12, 2010. ^ "USU Rocket Team Takes National Competition, Two in a Row" (Press release). Utah State University. June 6, 2009. Retrieved January 12, 2010. ^ "USU Water Research Soars to New Heights". Utah State Today. May 8, 2008. Retrieved June 19, 2016. ^ Purser, Annalisa (May 8, 2008). "USU Water Research Soars to New Heights". Utah State Today. Utah State University. Retrieved January 12, 2010. ^ "Departments and Programs: Anything is Possible". Archived from the original on May 24, 2016. Retrieved June 20, 2016. ^ "Departments & Programs/USU College of Humanities, Arts & Social Sciences". Utah State University. Archived from the original on December 22, 2011. Retrieved December 20, 2011. ^ "Mission Statement: American West Heritage Center". www.awhc.org. The American West Heritage Center. Retrieved February 8, 2018. ^ "Journals, College of Humanities and Social Sciences". Utah State University. Archived from the original on December 22, 2011. Retrieved December 20, 2011. ^ "The Mountain West Center for Regional Studies". Home page: The Mountain West Center for Regional Studies. Retrieved June 20, 2016. ^ "Manuscripts -- USU Special Collections". Retrieved June 20, 2016. ^ "Fife Folklore Archives". Retrieved June 20, 2016. ^ "Women, Wills, and Writings: Selections from USU's Jack and Charmian London Collection". Utah State University Digital Collections. Retrieved June 20, 2016. ^ "Library Exhibit Adds to 100th Birthday Celebration of May Swenson". Utah State Today. April 12, 2013. Retrieved June 20, 2016. ^ "Community Directory: USU Museum of Anthropology". Retrieved June 20, 2016. ^ "Utah State Students See 85 Percent Acceptance Rate to Medical School". Utah State Today. October 1, 2003. Retrieved June 26, 2016. ^ Carr, Jeff (December 3, 2009). "Alumni in Medicine". Utah State Today. Utah State University. Retrieved January 12, 2010. ^ "Recent history of achievement by USU physics undergraduates". Utah State University. Retrieved February 16, 2010. ^ "Degrees & Majors/USU College of Science". Utah State University. 2009. Archived from the original on May 27, 2010. Retrieved January 12, 2010. ^ "Actuarial Science Schools". Actuary.com. Retrieved February 17, 2010. ^ a b c "USU's Emma Eccles Jones College of Education and Human Services in Top 25". Archived from the original on May 27, 2016. Retrieved June 26, 2016. ^ a b "Rankings: Best Education Programs". U.S. News and World Report. 2014. Retrieved January 25, 2014. ^ "Database of APA-Accredited Psychology Programs". Retrieved June 26, 2016. ^ Jacobsen, Morgan (July 21, 2015). "Report: USU department 'may be the top program in the world' for research productivity". The Deseret News. Retrieved June 26, 2016. ^ "Karl White Honored by Alexander Graham Bell". aaas.org. Archived from the original on August 16, 2016. Retrieved June 26, 2016. ^ "Housing and Financial Counseling – Family, Consumer, & Human Development". usu.edu. Retrieved November 1, 2011. ^ "Marriage and Family Therapy Program". Retrieved June 26, 2016. ^ "Huntsman gives USU business school $26 million". Deseret News. 2007. Retrieved March 19, 2011. ^ "Business Administration Major". Retrieved July 2, 2016. ^ "Majors and Minors". Retrieved June 26, 2016. ^ "Full Disclosure" (PDF). Retrieved June 26, 2016. ^ "Utah State University". www.usnews.com. U.S. News & World Report. Retrieved April 2, 2017. ^ "Full Disclosure: Newsletter of the School of Accountancy" (PDF). Utah State University. Retrieved January 12, 2010. ^ Utah State University. "Huntsman Scholar Program". Huntsman.usu.edu. Retrieved September 23, 2016. ^ Middleton, Diana (February 17, 2010). "Utah State B-School Hires Stephen Covey". Wall Street Journal. Retrieved February 18, 2010. 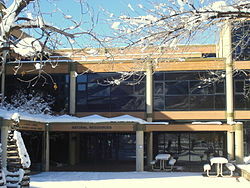 ^ The Shingo Institute at Utah State University. "Education – Shingo Institute". Shingo.org. Retrieved September 23, 2016. ^ "Gov. Herbert visiting USU to sign two USU-related House bills". Cache Valley Daily. March 30, 2011. Archived from the original on September 11, 2011. Retrieved April 2, 2011. ^ "USU aims to attract entrepreneurs with new $50M business building". Newspaper. The Salt Lake Tribune. Retrieved June 29, 2016. ^ Jacobsen, Morgan. "USU business students get new space for learning". Retrieved June 29, 2016. ^ "S. J. & Jessie E. Quinney College of Natural Resources Research Library". Retrieved June 30, 2016. ^ Van Valkenburg, Nancy (March 18, 2014). "USU names College of Natural Resources after philanthropic Quinney Foundation". Retrieved July 1, 2016. ^ Wood, Benjamin (September 26, 2012). "Natural resources college at USU announces new name, $10M donation from Quinney Foundation". Newspaper. The Deseret News. Retrieved July 1, 2016. ^ "College of Natural Resources". USU College of Natural Resources. Retrieved January 12, 2010. ^ a b "Enrollment Summary Fall Semester 2015" (PDF). Retrieved July 1, 2016. ^ "Reception Honors Carnegie Professor of the Year David Peak". Utah State Today. Utah State University. January 14, 2010. Retrieved January 15, 2010. ^ "Professors and Undergraduates Benefit From NSF Funding". Office of Research and Graduate Studies. Retrieved July 2, 2016. ^ "Utah". Directory of Institutions. Northwest Commission on Colleges and Universities. June 27, 2011. Archived from the original on February 13, 2012. Retrieved December 20, 2011. ^ Opsahl, Kevin (April 25, 2016). "USU student fourth in 36 years to receive Truman Scholarship". Newspaper. The Herald Journal. Retrieved July 1, 2016. ^ "Utah State University". U.S. News and World Report. Retrieved July 1, 2016. ^ a b "Top Colleges 2014: Best Schools, Best Value, Best For You". Forbes. ^ "The 50 Most Underrated Colleges in America". Business Insider. January 28, 2015. Retrieved January 28, 2015. ^ a b "Utah State University At a Glance". Forbes. Retrieved July 2, 2016. ^ "Harvard University Forbes Profile". Retrieved July 2, 2016. ^ "Yale University Profile". Retrieved July 2, 2016. ^ "Princeton University Forbes profile". Retrieved July 2, 2016. ^ "Best Online Bachelor's Programs". U.S. News & World Report. U.S. News & World Report. Retrieved January 15, 2017. ^ "Best Western Colleges". Princeton Review. 2009. Retrieved January 11, 2010. ^ Mika, Eric (September 12, 2008). "A Geek's Guide to Colleges". Popular Science. Retrieved January 14, 2010. ^ a b "Utah State Wins National Championship for Most Economically Efficient Athletics Department". Utah State University. Retrieved February 8, 2011. ^ "Table 33. Higher education R&D expenditures at public institutions, ranked by all R&D expenditures, by source of funds: FY 2014". Retrieved August 16, 2016. ^ "The best schools of 2017". MSN.com. Archived from the original on July 7, 2017. Retrieved June 15, 2017. ^ a b c d "QuickFacts: Cache County". The United States Census Bureau. Retrieved July 2, 2016. ^ "Current Population Reports U.S. Department of Commerce Economics and Statistics Administration U.S. CENSUS BUREAU census.gov Income and Poverty in the United States: 2014" (PDF). Census.Gov. Retrieved July 2, 2016. ^ "US Household Income". Department of Numbers. Retrieved July 2, 2016. ^ "United States QuickFacts". Census.Gov. Retrieved July 2, 2016. ^ McInelly, Curtis. "Cache Valley crime rates are below Utah averages". Newspaper. Retrieved July 2, 2016. ^ "City Crime Rankings by Population Group". Morgan Quitno. 2006. Archived from the original on December 11, 2006. Retrieved January 14, 2010. ^ Stockwell, Carly. "10 of the safest college campuses in the U.S." USA Today. Retrieved June 19, 2016. ^ Zupek, Rachel (November 24, 2008). "30 Best Cities to Find a Job". CNN/CareerBuilder.com. Retrieved January 14, 2010. ^ "Best Small Places for Business and Careers". Forbes. 2007. Retrieved January 14, 2010. ^ "Carnegie Classifications: Utah State University". Carnegie Foundation for the Advancement of Teaching. Retrieved January 28, 2010. ^ "USU Continues Trajectory of Record Research Funding". Utah State Today. Retrieved November 20, 2016. ^ "Undergraduate Research Guidebook" (PDF). Retrieved July 2, 2016. ^ "Undergraduate Research". Archived from the original on April 7, 2016. Retrieved July 2, 2016. ^ "Utah State University Undergraduate Research Program Celebrates 35 Years of Hands-On Learning". Utah State University. February 26, 2010. Archived from the original on July 19, 2011. Retrieved March 22, 2010. ^ "USTAR". Business.Utah.Gov. Archived from the original on March 23, 2009. Retrieved July 2, 2016. ^ "Business, Economic Development, and Labor Appropriations Subcommittee". Utah State Legislature. Retrieved July 2, 2016. ^ Opsahl, Kevin. "USU demonstrates in-motion electric vehicle power transfer". Newspaper. The Herald Journal. Retrieved July 2, 2016. ^ Reyes, Julian (August 2012). "University of Utah to launch electric bus prototype". Deseret News. Retrieved December 9, 2012. ^ Maffly, Bryan. "U. of Utah shuttle system getting wireless electric bus". The Salt Lake Tribune. Retrieved December 9, 2012. ^ "Space Dynamics Laboratory". Space Dynamics Laboratory. Retrieved July 2, 2016. ^ "The Utah Water Research Laboratory". The Utah Water Research Laboratory. Retrieved July 2, 2016. ^ "About HPC". Archived from the original on June 23, 2016. Retrieved July 2, 2016. 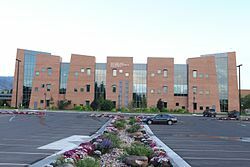 ^ "The Utah Climate Center". The Utah Climate Center. Archived from the original on May 27, 2016. Retrieved July 2, 2016. ^ "Applied Nutrition Research". Applied Nutrition Research. Retrieved July 2, 2016. ^ "The Center for the School of the Future". The Center for the School of the Future. Retrieved July 2, 2016. ^ "Welcome to the Bug Lab". Retrieved July 2, 2016. ^ "Mountain West Center for Regional Studies". Mountain West Center for Regional Studies. Retrieved July 2, 2016. ^ "USU Botanical Center". USU Botanical Center. Retrieved July 2, 2016. ^ "Swaner Preserve & EcoCenter Makes Largest Gift in USU's History". Retrieved July 2, 2016. ^ H, D (October 23, 2008). "Photo Tour: Swaner EcoCenter, the Greenest Building in Utah". Jetson Green. Retrieved July 2, 2016. ^ Bringhurst, Kerry. "New Director Announced For Swaner Preserve And EcoCenter". Radio. UPR. National Public Radio. Retrieved July 2, 2016. ^ Iwasaki, Scott (June 28, 2016). "Recycle Utah plans 100 Mile Meal for 100 people". Newspaper. ParkRecord.com. Archived from the original on July 2, 2016. Retrieved July 2, 2016. ^ Vitale, Tim. "Swaner Preserve & EcoCenter Makes Largest Gift in USU's History". Utah State Today. Utah State University. Retrieved January 18, 2010. ^ "Back in Flight: Aggie GAS Team to Ride NASA's 'Vomit Comet'". Utah State Today. January 14, 2010. Retrieved November 27, 2010. ^ "Cloning Fast Facts". CNN. Retrieved July 2, 2016. ^ "NATION Gordon Woods dies at 57; Veterinary scientist helped create first cloned mule". LA Times. Retrieved July 2, 2016. ^ Torres, Phil (October 28, 2014). "Spiders and transgenic goats lead to new silk road". Aljazeera. Retrieved July 2, 2016. ^ Fattah, Geoffrey (July 5, 2011). "A web of possibilities: Utah researcher uses goats to make one of the strongest known substances". Deseret News. Retrieved September 3, 2011. ^ "Pond Scum: Fueling Our Future?". Physorg.com. January 30, 2007. Retrieved January 19, 2010. ^ Passey, Brian (May 10, 2010). "Student's idea turns roadsides into biodiesel cash cropland". USA Today. Retrieved June 2, 2010. ^ Kirchner, Ann (April 8, 2012). "Innovations in Higher Education? Hah! College leaders need to move beyond talking about transformation before it's too late". Chronicle.com. Retrieved July 2, 2016. ^ a b c d "Championships". UtahStateAggies.com. Archived from the original on July 18, 2016. Retrieved July 3, 2016. ^ a b "USU Baseball Team Wins National Championship for Second Time". Utah State Today. May 29, 2014. Retrieved July 2, 2016. ^ a b "Proclamation: USU National Champion" (PDF). Retrieved July 3, 2016. ^ a b "USU's club sports win national championships but get little support". Hard News Cafe. May 2, 2013. Retrieved July 3, 2016. ^ a b "USU's Rodeo Team Produces National Champions". The Statesman. Retrieved July 3, 2016. ^ Jones, Tony. "Utah State is headed for Mountain West Conference". Newspaper. The Salt Lake Tribune. Retrieved July 2, 2016. ^ Williams, Craig (May 4, 2012). "Advertise with usReport this ad It's official, Utah State joining MWC in 2013". Newspaper. The Deseret News. Retrieved July 2, 2016. ^ "Jay Don Blake, Dan Forsman, Todd Barker to be inducted into the Utah Golf Hall of Fame". Retrieved July 3, 2016. ^ "Utah State All-Americans". Archived from the original on September 24, 2016. Retrieved July 3, 2016. ^ Hummel, Zack. "The 15 Toughest Places To Play In College Basketball". The Ledge Sports. Retrieved July 3, 2016. ^ Ericson, Katelyn (November 10, 2011). "USU students #occupythespectrum". KSL. Retrieved December 20, 2011. ^ "2009 NCAA Men's Basketball Rankings (Feb. 9)". ESPN. Retrieved January 13, 2010. ^ "Utah State Basketball". Stew Morrill and AllCoachNetwork.com. Retrieved January 13, 2010. ^ Luhm, Steve. "Utah State basketball: Sticking around pays off for new Aggie coach Tim Duryea". Newspaper. The Salt Lake Tribune. Retrieved July 3, 2016. ^ "2012 Utah State Aggies Football Schedule Final Record: 11-2, 6-0 (WAC)". FBSchedules. Retrieved July 3, 2016. ^ "2012 College Football Rankings – Postseason". ESPN. Retrieved July 3, 2016. ^ Zundel, Rod. "Matt Wells named new Utah State head football coach". KSL.com. Retrieved July 3, 2016. ^ McNulty, Megan. "New Aggie men's tennis coach revealed". USU Statesman. Retrieved July 2, 2016. ^ Emerson, Taylor. "Aggie handball tradition carries on". HJnews.com. Pioneer News Group. Retrieved April 1, 2017. ^ "USU Intramural". Retrieved July 2, 2016. ^ "Western Historical Quarterly". Western Historical Quarterly. Archived from the original on June 30, 2016. Retrieved July 2, 2016. ^ "Western Literature Association". Western Literature Association. Retrieved July 2, 2016. ^ "Utah State University Press". Utah State University. Retrieved January 12, 2010. ^ "2002 Mark of Excellence Region 9 Winners/Finalists". Society of Professional Journalists. Archived from the original on July 29, 2011. Retrieved March 21, 2011. ^ "Student Support Programs-- About". Utah State University. Retrieved March 21, 2011. ^ "Broadcast". usu.edu. Utah State University Journalism and Communication. Retrieved February 11, 2018. ^ "Fusion HD3". Utah State University. Retrieved January 26, 2010. ^ "Aggie Television". Utah State University. Archived from the original on April 27, 2009. Retrieved December 14, 2010. ^ Mitchell, Lisa. "Hamburg native Rich Etchberger named Utah's Carnegie Professor of the Year". Berks-Mont News. Archived from the original on June 16, 2016. Retrieved June 11, 2016. ^ Halversen, Taylor (November 15, 2013). "Utah State University Professor Wins National Award". UPR Utah Public Radio. Retrieved June 11, 2016. ^ Opsahl, Kevin (November 25, 2012). "USU guitar guru Mike Christiansen honored". The Herald Journal. Retrieved June 11, 2016. ^ a b "Another USU professor honored as Carnegie Professor". CacheValleyDaily. November 18, 2011. Retrieved June 11, 2016. ^ "Carnegie Foundation honors Utah State University engineering professor". Deseret News. November 18, 2010. ^ "USU professor named 2009 Utah Carnegie Professor of the Year". CacheValleyDaily.com. November 19, 2009. Retrieved June 11, 2016. ^ "Lyle McNeal '64, animal husbandry". Retrieved June 11, 2016. ^ "Bonnie Glass-Coffin". Archived from the original on May 29, 2016. Retrieved June 11, 2016. ^ "Recognition of outstanding professors Mr. James Adams and Dr. Dennis C. Jacobs". Retrieved June 11, 2016. ^ "Foundation honors USU professor". Deseret News. November 20, 2001. Retrieved June 11, 2016. ^ a b c d "Wildlife science professor is USU's 14th Carnegie awardee". The Herald Journal. November 20, 2015. Retrieved June 11, 2016. ^ "David B. Haight Alumni Center". Utah State University. Retrieved November 6, 2011. ^ "Utah State Alumni Association Chapters". Utah State University. Archived from the original on November 9, 2011. Retrieved November 6, 2011. ^ Wood, Benjamin (2013). "Utah native among Nobel Prize winners in economics". Wikimedia Commons has media related to Utah State University.